This leather note case was made from Cow Polished Black leather. 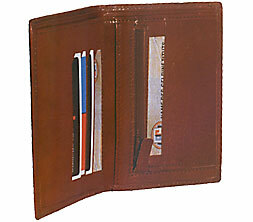 It has two pockets of size 12 x 6.5 cm on the LHS along with 6 credit card slots and a net window for the driving license. There are two side pockets of 9 x 12 cm. On the RHS is a zip pocket for coins. Two note compartments are also present. 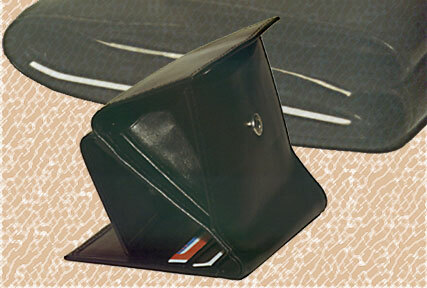 A leather notecase wallet. On the back is a pocket for putting your tickets or any small notes that should be handy. The interior has two note compartments for currency. The RHS has a press button pocket for coins and a small pocket for your visiting card. At the bottom of the pocket is a small net window. If your card has the name at the bottom, it would be visible. On both sides there are two side pockets. 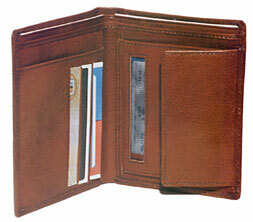 The LHS has three credit card slots and one pocket of size 10 x 9 cm. 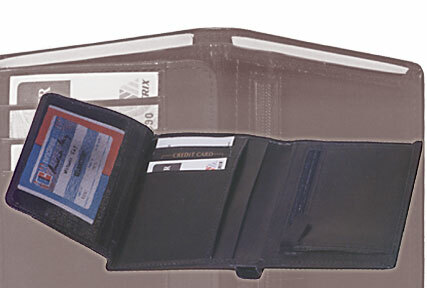 This is a wallet with two separate enclosures. On one side is a pocket for coins with a partition in the middle. The other size opens up to a size 17.5 x 10 cm. It has three note compartments, two side pockets and four credit card slots. The exterior has a net design located on the centre. There are two note compartments, a zip pocket for coins with a card slot, driving license window, 4 credit card slots and two side pockets.